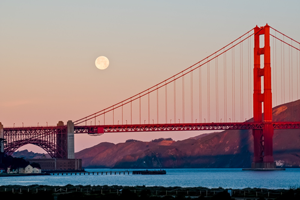 Business owners located in California – from coffee sellers to manufacturing facilities to apartment complexes – as well as out-of-state companies selling products in California, are taking note of new updates to Prop 65, a decades-old law that’s been revamped. The law requires companies doing business in California to provide warnings (including safety labels on products and signs in workplaces and public environments) before causing significant exposures to chemicals known to cause cancer or reproductive toxicity. It’s not too late to get up-to-speed on the important facts you need to be aware of regarding the impact of the latest requirements. 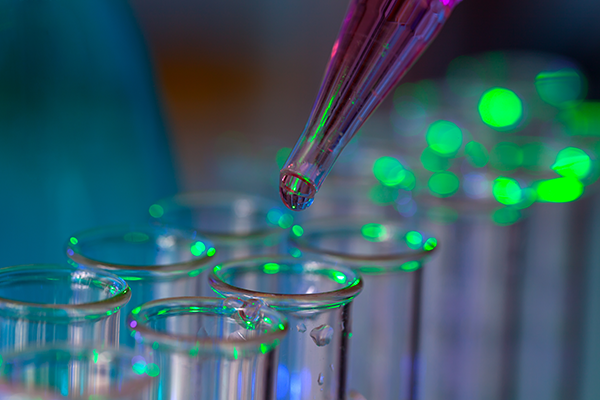 Stricter Prop 65 requirements are effective August 30, 2018 for all products manufactured after that date – and the stakes for not complying are high. Unless you’re an exempt business – such as one with less than 10 employees – it’s time to ensure you’re following the latest updates to the regulation. Penalties for violating Prop 65 by failing to provide warnings can be as high as $2,500 per violation per day. 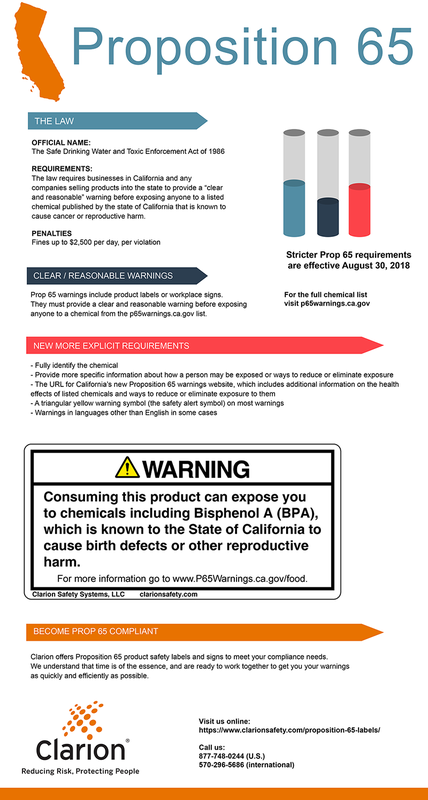 One of the biggest changes to Prop 65 is that warnings are now required to be more explicit. You’ll need to fully identify the chemical and provide more specific information about how a person may be exposed or ways to reduce or eliminate exposure. This is in line with the shift we saw in 2012 with OSHA’s hazard communication standard moving beyond just the “right to know” and towards the “right to understand” for chemical safety in the workplace. At Clarion, we offer Proposition 65 product safety labels and signs to meet your compliance needs. We understand that time is of the essence, and are ready to work together to get you your warnings as quickly and efficiently as possible. Our quote response turnaround time is fast (typically one business day). Keep in mind that we can also work with you to fast track your order or delivery. The first step is knowing when a Prop 65 warning is needed and what chemical information needs to be listed. The California Prop 65 chemical list currently contains about 900 chemicals. Stay in-the-know with chemicals to be warned about on your labels and signs by downloading our Excel file. This list was last updated May 25, 2018; keep in mind that the state of California is charged with maintaining the list at least once a year, but may update it more frequently.